Believe it or not there was a time when kids used to grow up without the Internet. Mind you these kids did have some wonderful games to play. How about quartettes? Quartettes is a card game. Each pack usually contains 32 cards and is played with 2 players or more. A pack includes items of the same type e.g. cars, boats, airplanes. Every one of them has its own photo and its technical characteristics as you can see from the image above. The winner should gather four items, a quartette. The more the quartettes the better. One of the players started to pick out a technical detail of the list. 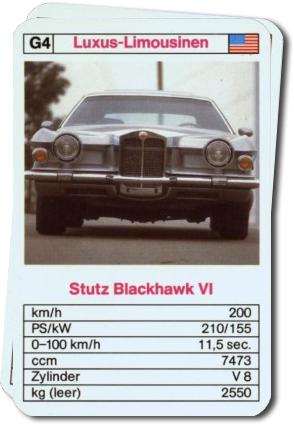 The best car win the other cards. Winner of the game is who has collected all the cards. I remember me and my friends playing this card game for hours. We were pretty obsessed with it to tell you the truth. Unfortunately I have lost my packs. So, I’d love to see on eCharta one of the quartettes I used to play when I was a kid. I’m going to buy it that very moment. The modern era thanks to the technology has a million ways to retain memories. Digital photoalbums are one example. Personal diaries as applications are another. Sure, I like them but at times they seem too artificial to me. There’s a concept I’ve seen in movies and I find it extremely powerful as a memory retainer and elegant too. I bet you have seen it as well. Do you remember these suitcases covered with stickers? Aren’t they fantastic? See what paper can do? A few tiny pieces of paper can act as personal narrator. They can bring back memories of journeys and each single combination of stickers is unique. 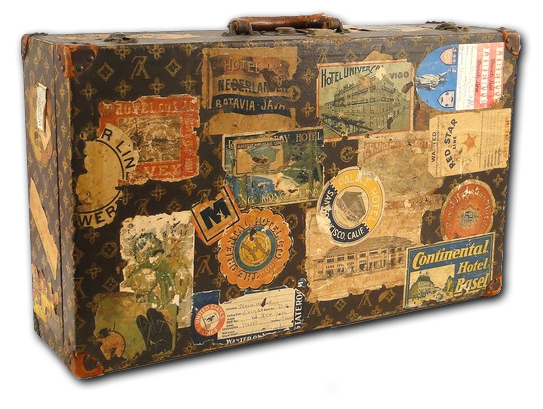 According to Scuidoo Luggage labels was created to identity passengers for traveling on trains or plains, it helped them determine where the bags was headed. The stickers quickly became a hit and became badges of honor, to represent where they have traveled. Paper as a badge of honor? Yes, sir! Did you know that on eCharta you can sell and buy such labels? Is it too late to start your very own collection? I don’t think so. 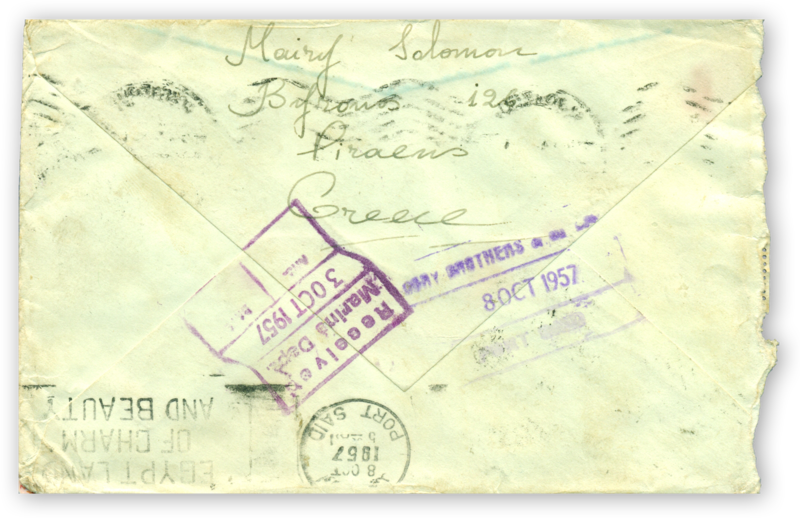 This envelope is an extraordinary piece of postal history and it was sent by a lady, named Mary Solomou. It left Piraeus with a postmark dated 30th September 1957 and with the postage stamp value of 7 drachmas and 30 lepta, strangely enough, as the current rates for a single letter were 3 drachmas for the first 20 grams and 1.80 for every extra 20 grams. Its destination was the offices of ESSO PETROLEUM in London in order to be forwarded to the “Master Peter” ship and, thus, reach the hands of its receiver: Dimitrios Arifis, probably another seaman. It arrived in London on 3rd October 1957, as the date stamp bears witness – “RECEIVED MARINE DEPARTMENT” – at the back of the cover, where it was discovered that the actual ship had been anchored in Port Said, Egypt. 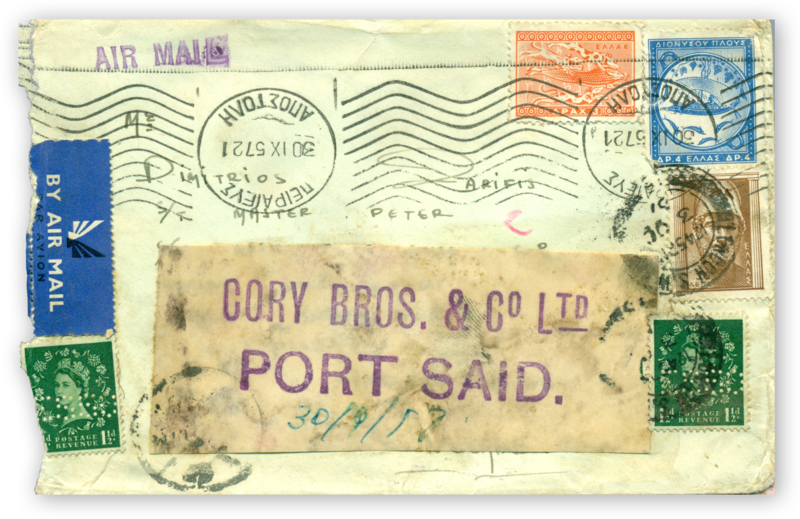 The name and address of the shipping company: “Cory Bros and Co LTD Port Said” along with an air vignette and a small “Air Mail” stamp were attached in order for the letter to be forwarded there. In addition, there were two postage stamps 1 and ½ d respectively with Queen Elizabeth with ESSO perforation and one of them was cancelled with a “LONDON 3 Oct 57” date stamp. The cover finished its journey on 8th October 1957, going by the cancellations it received at the back of it – “Cory Brothers and Co Ltd 8 Oct 1957” and “Port Said 8 Oct 1957” along with the slogan postmark of the Egyptian Post: “EGYPT LAND OF CHARM AND BEAUTY”. Finally, we notice that there is an Egyptian censorship hand stamp at the front of the envelope on the address adhesive label. What this sailor felt like when he was reading the lines written by hand from his dearest person? When I think back of my childhood I always tend to stick to certain moments. Most of them are connected with paper. Paper stories, if you like. It’s all about Asterix and Lucky Luke and Tin Tin and numerous other comic books. The years have passed by but I keep reading them again and again. In fact I never considered comics as material for kids only. Furthermore, they are a good reason not to forget the childhood years. That’s where they’re getting precious. By the moment I got connected to eCharta I keep thinking of how to get back the issues lost through the years. So here’s my greatest wish: to find and buy the Eric Castel series (more on the creator of Eric Castel, Raymond Redding). In English please. 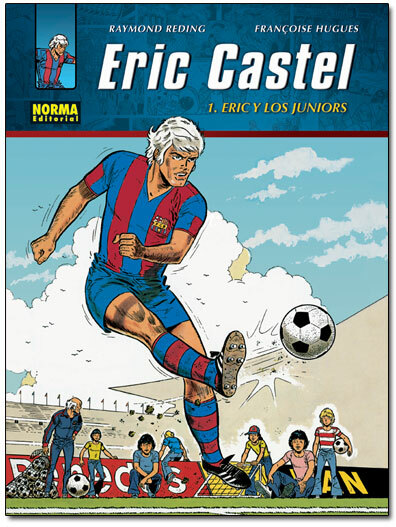 So I hope one day my wish will become true and there will be someone who wants to sell one or more issues of Eric Castel via eCharta. I’ll be a good buyer, I promise. This is our first post and as you may understand we are still a little shy! But we’ll quickly drill with because we have important things to say and let everybody know about this new world of paper. We want to point out first that we created an auction platform where you can exchange exclusively and safely items made of paper, because of our same need. Some of us are collectors of paper items such as stamps, postcards, comics etc. We got to tell you! We are tired of seeing cars, furniture and shirts when we wanted to see what we’re really looking for in a specialized environment with no ads and no other external interference. Our platform supports everything you might need to start selling and buying paper stuff right now. At the same time we’re working on more features which are going to enhance your eCharta experience. So we kindly ask you to stay tuned and watch the announcements of this blog. We know we’re not alone in this. In fact we want your help to create an active community that meets its needs. We want everyone to contribute articles for improvement, information and expertise in order to overcome the expectation and make eCharta the synonym of paper! Very soon we’re going to share with you the hows, so there’s one more reason to watch this space.